The UN Conference on Climate Change held on November 29 - December 11 in the Mexican city of Cancun has brought neither significant results, nor big disappointments. Russia's position over the last year has not changed and has not become more constructive. The Conference adopted the goal of reducing greenhouse gas emissions stated by countries a year ago. These goals are still too weak to solve the problem of climate change. The Green Climate Fund was agreed to be established for adaptation to climate change. The set of decisions adopted at the conference gives hope for the possibility of a new comprehensive climate agreement. Forestry is one of the main topics of UN climate talks in Cancun, Mexico. Russia has 23 % of the world's forests and is the real lungs of the planet. However, Russian boreal forests have no proper global appreciation. If the Russian taiga is not urgently included in the climate mechanisms, the planet will lose a major absorber of CO2. Position of the Russian environmental NGOs was presented at the UN Conference on Climate Change COP 16 in Cancún. Environmental activists oppose the transfer of quotas for GHG emissions left over from 2008 - 2012 period to the future. Environmental groups are calling on Russia to declare a moratorium on the sale of 6 billion tonnes of "the Kyoto period" quotas until at least 2020. Russian NGOs call to exclude completely nuclear power from the climate mechanisms and texts under negotiations. 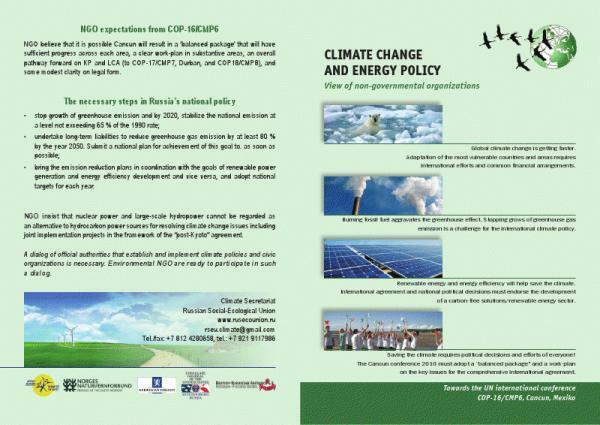 The booklet of the Russian Socio-Ecological Union about position of the public on climate change and energy policy was presented at the conference. Monday 6 December was the “Health Day” in Cancun. Leading global medical and health groups launched the "Cancun Climate and Health Statement" for delegates. The statement calls on negotiators to consider the "real costs" of climate change and the benefits of strong action by taking the human health dimension into account. Analysis of Russian scientists has shown that reducing CO2 emissions by 3.5 thous. tons saves one human life in Russia per year. The future of the Kyoto Protocol (KP) and transfer of its mechanisms for subsequent periods is discussed in Cancun. Russia has repeatedly stated that it considers appropriate to transfer unused quotas for CO2 emissions to the future periods of international agreements. Environmental NGOs are calling to abandon the sale of quotas and to take action to actually reduce emissions. 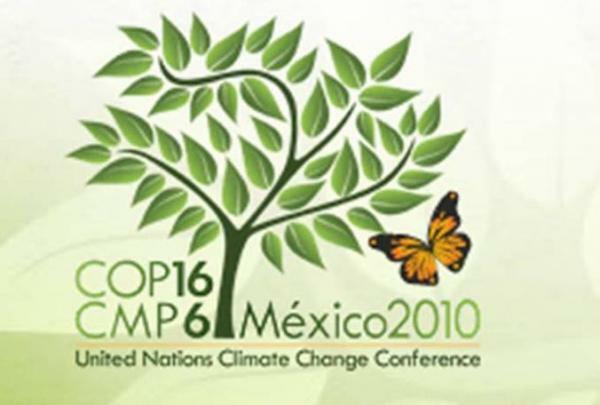 The Mexican city of Cancún will host from 29 November to 10 December 2010 the UN Conference (COP-16) on climate change and international agreements to reduce human impact and to adapt to the climate change consequences. Public organizations made proposals to Russia's position to the COP-16. Russia may have endured its hottest summer on record and battled deadly forest fires, but attitudes on climate change remain dominated by scepticism and even mired in conspiracy theories – on the eve of the Cancun UN climate negotiations.